Punjabi University Result 2018 has been declared. Candidates can check Punjabi University Patiala Result regular/reappear/private/cc candidates/distance education form this page. 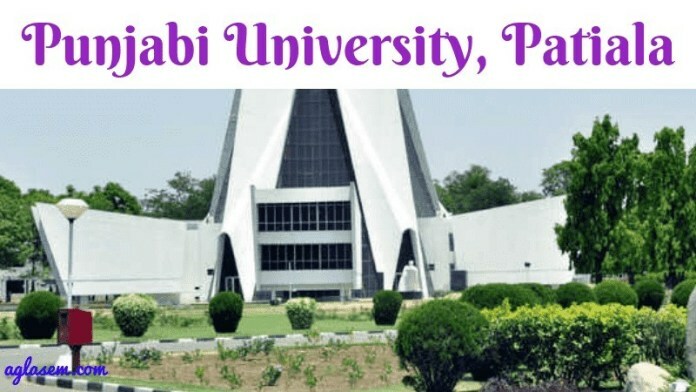 Punjabi University Result is available for BA, MA, BSc, B.Com, BCA, MSc, B.Com and other courses. Candidates “Roll Number” is required to check the result. It is notified that the result published online is just for the immediate information and shall not be considered as the final mark sheet. A candidate is considered as pass when the marks are awarded in the result field. Candidates qualifying the exam will be promoted to the next semester and shall receive a mark sheet indicating the details marks obtained in the exam. To be eligible for the degree certificate candidates have to complete all the semester successfully without any back papers. Check the page for Punjabi University Result 2018. Latest: Punjabi University Patiala has released the result of M.A.J.M.C. Improvement- Dec 2018. Results: Candidates can check Punjabi University Exam Results at www.punjabiuniversity.ac.in. How to Check Punjabi University Result 2018? Candidates appear in the semester exam conducted by the Punjabi University can check their result through the link provided in the table. Click the link and follow the steps mentioned below. The university will not be responsible for any error in the result published online. The result published on the net is just for immediate information. Candidates can consult the concerned gazette for confirmation. Do not consider these result as the final marks sheet. The original Mark Sheet is issued by the Punjabi University. Candidates can apply for the re-totalling of the answer sheet after the declaration of the result. To do so candidates have to submit the application form regarding the re-totalling of the particular subject. The rechecking form for the answer sheet is available online. Candidates have to submit the filled from within the prescribed date. If the candidate wishes for the re-checking of the complete answer sheet then they have to apply for the revaluation of the answer sheet. Candidates can seek a revaluation of the theory paper only. Revaluation of the answer sheet is a chargeable process. Candidates have to fill the application form and submit the fees as prescribe by the university. No form shall be accepted after the last date.